It is my hopes that everyone has wonderful holiday moments from their youth and as grown-ups, can look back on those memories with great fondness. 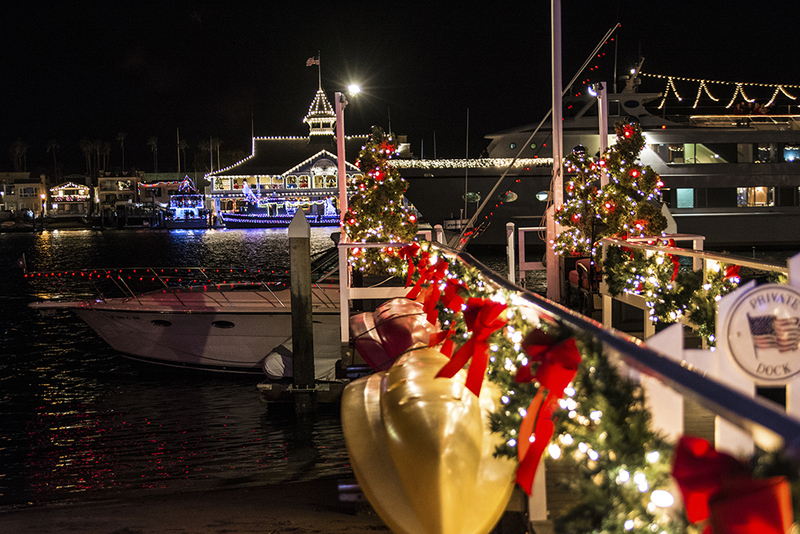 I know I have tons of recollections from growing up near a place that is always filled with holiday spirit, the illustrious Newport Beach Harbor. 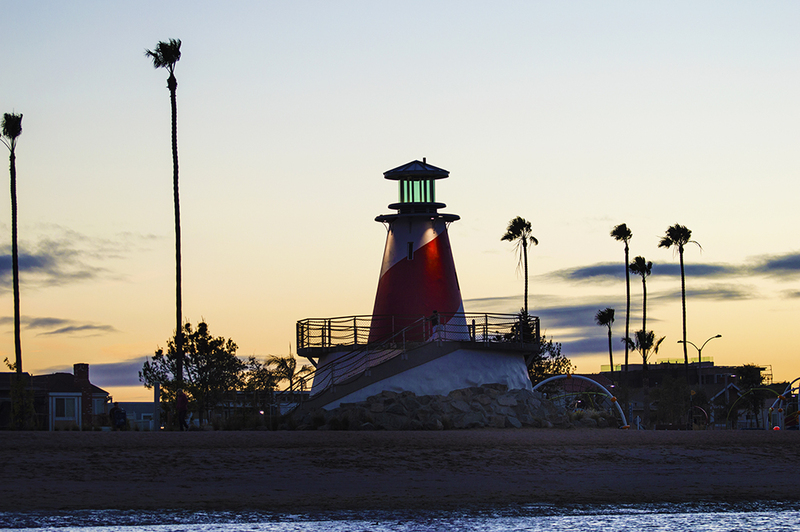 In my youth, Newport was always dressed up in impressive yuletide style, from the brightly lit city hall, to the impressive homes and yachts at water’s edge in the harbor. 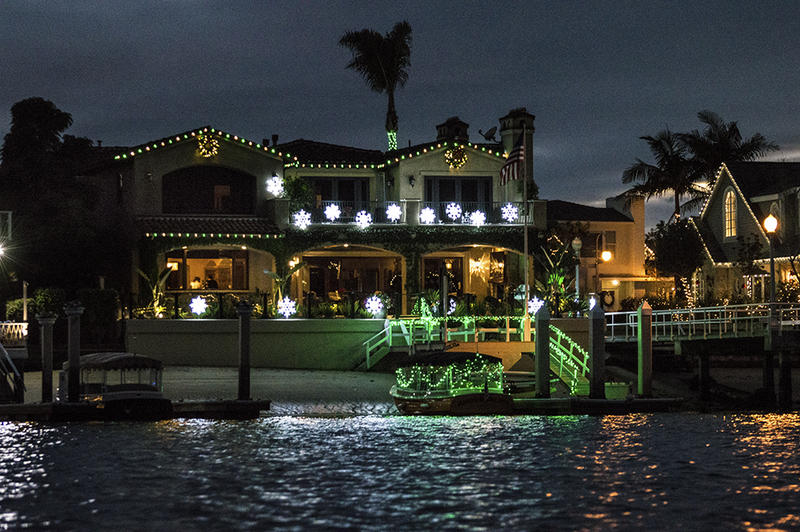 The annual boat parade is one of the best in the west with boats and yachts of every size participating during its run December 16-20, 2015. This year, we rented an electric Duffy boat to view the homes from the water and which also enabled us to see more home fronts that you normally couldn’t see from the road. We started out about an hour before sunset and had it rented until an hour and half after sun down. The daylight gave us the opportunity to see the beautifully decorated houses and also a chance to explore the harbor before it got dark. Munchies were spread out on the table and the plastic walls covering the sides kept us warm against the wind. Christmas melodies rang out from the radio and battery operated lights gave our little cabin a holiday feel. I dressed warm in case it was cold on the bay and by warm, I mean California style. I am sure my attire would make someone from the Mid West laugh because a thick sweatshirt wouldn’t cut it on their cold winter evenings. 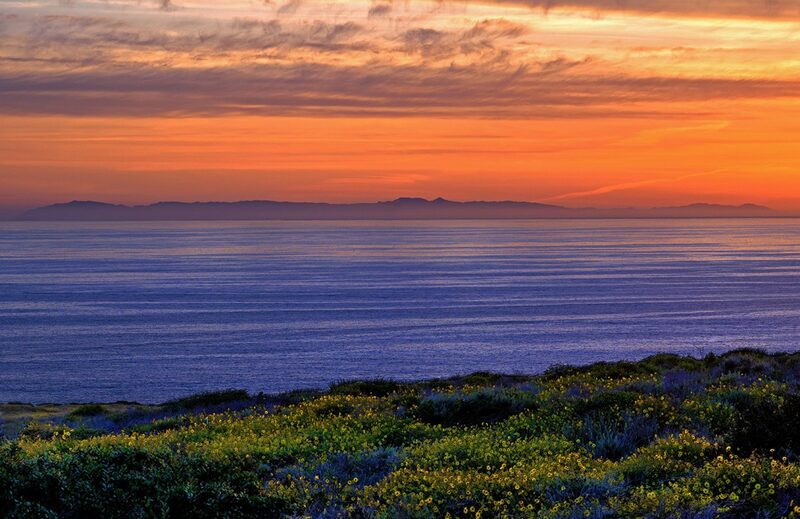 As I have said many times, that is why we pay the big bucks to live in California. Just a few blocks west, the sun finally set over the ocean and soon the colorful lights of the houses and boats came alive making the harbor look like a holiday wonderland. 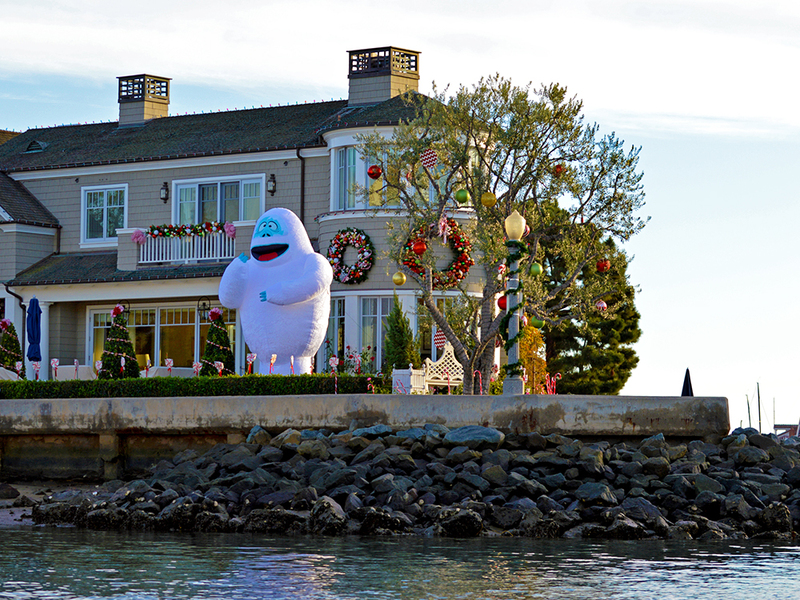 Some of the residences looked like theme parks with huge blow ups everywhere and thousands upon thousands of lights. 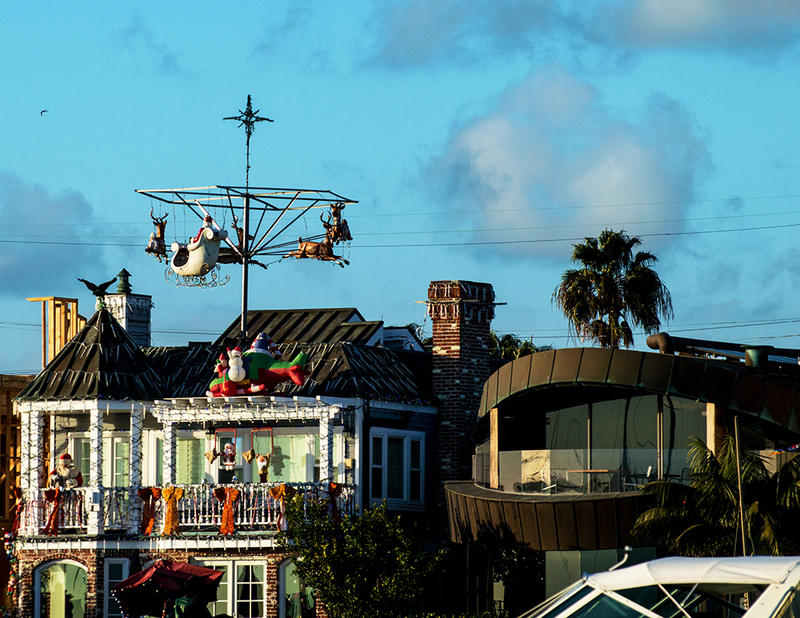 One house had a moving Santa and reindeers on the very top spinning around for all to see. Some looked elegant with beautiful garland and wreaths while others looked fun and whimsical. 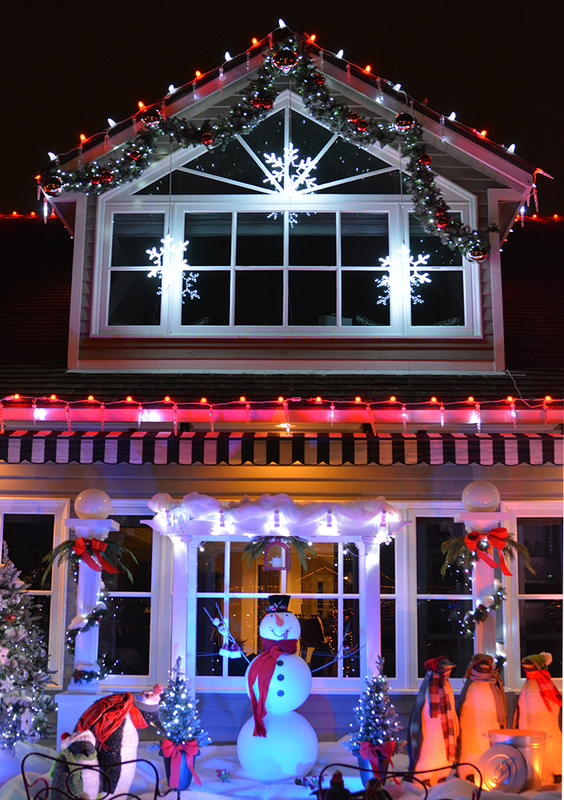 Tastefully decorated cottages sat next to huge mansions and both were aglow with every color light imaginable. As twilight turned the bay to dark it became a little harder to see around the water. Luckily the beautifully illuminated houses and boats gave us bright vantage points to help negotiate around the channels. A lit up dock, the Pavilion in the background, and a huge yacht passing by on the right. I spent many days fishing in that harbor so I know it like the back of my hand; still it was nice having passengers help me with spotting other boats and navigating around buoys that are harder to see. 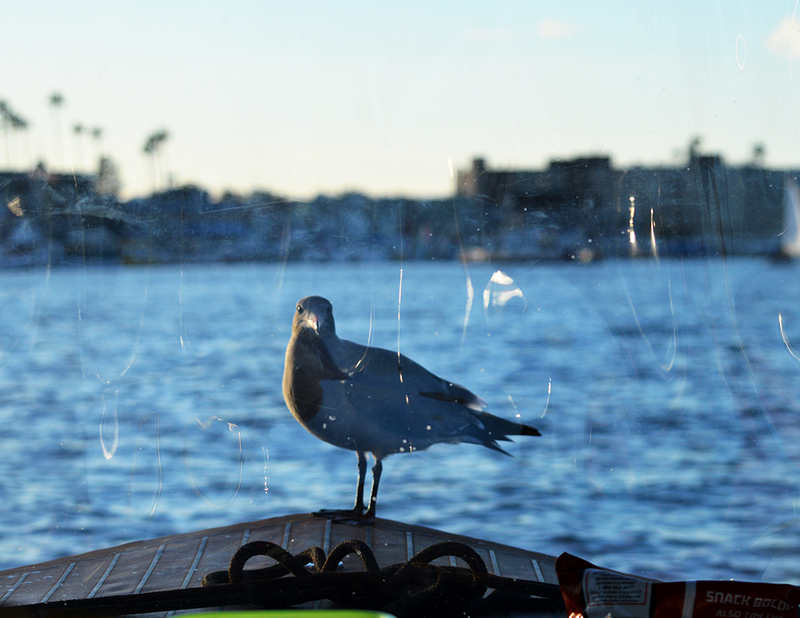 We planned this trip before the boat parade so the water traffic wouldn’t be so heavy. During the parade and especially on the weekend, the harbor comes alive and you have to be on your toes as every size and shape boat is traveling in the same lanes as you are. 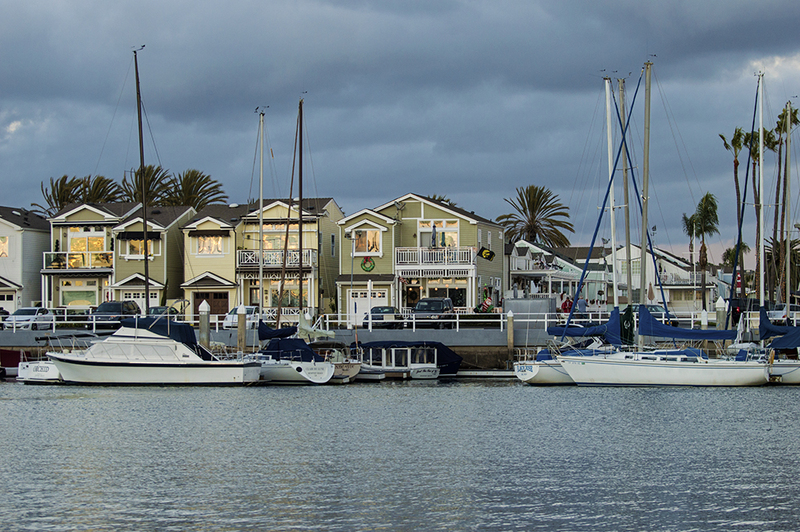 In past years, we strolled along the boardwalk on Balboa Island and our only excursion on the water was to take the 3 minute ferry ride across from the peninsula. So being on the water during this time is a new experience and one I highly recommend if you get the chance. 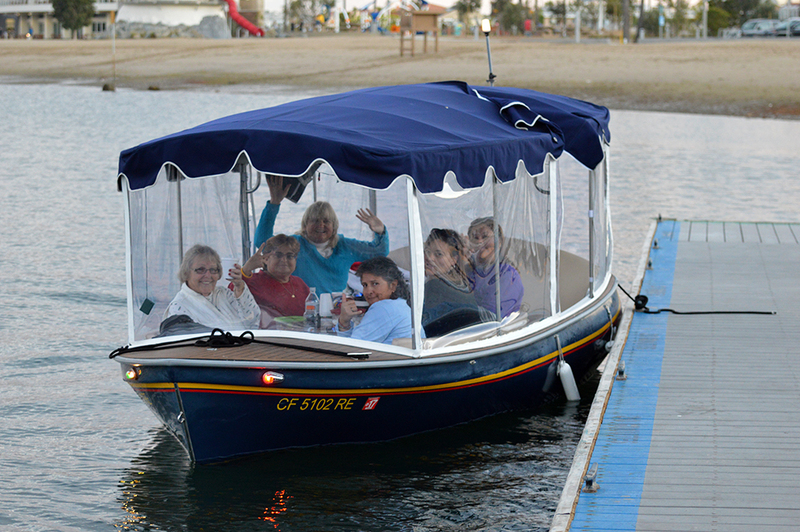 Make sure you are careful out there though; there are no headlights on the Duffy boats. 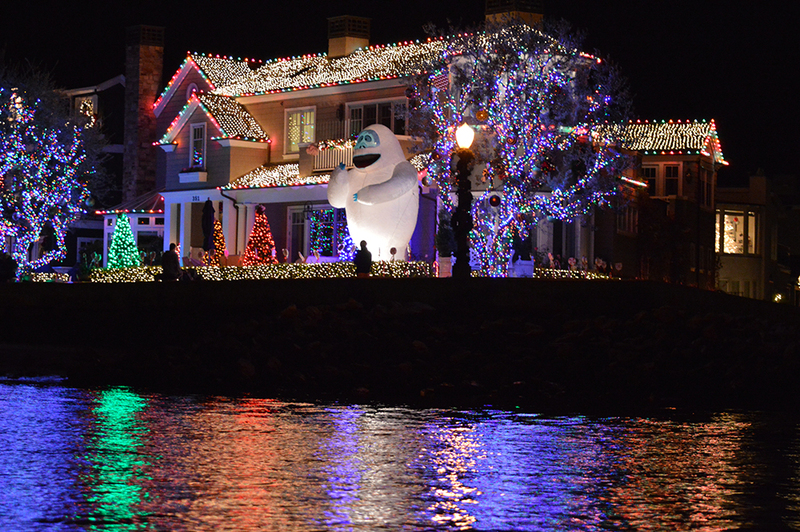 The homes along the harbor are not the only ones lit up. 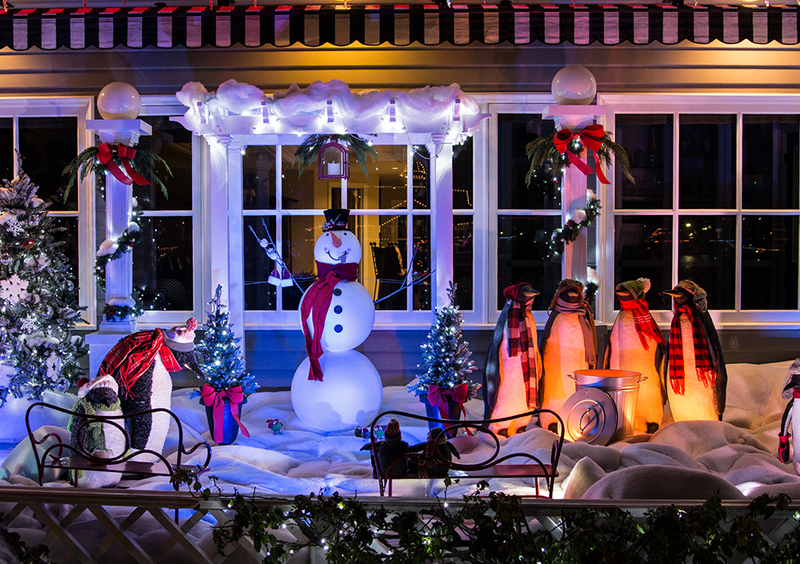 If you drive your car through the narrow streets of Balboa Island, you will be amazed on how many houses are glowing with lights and decorations that could keep you there for hours. It is just a wonderful place and as mentioned, my beloved childhood home. We made one last loop near the entrance to the harbor and headed back to the dock with plenty of time to spare. Rain was predicted to hit during our ride, but it held off until we were finished and safely at the dock. Only when we were walking to our car did we feel the first gentle drops of drizzle starting to fall. Soon came a downpour and we thanked our lucky rain angel for holding it off for awhile. 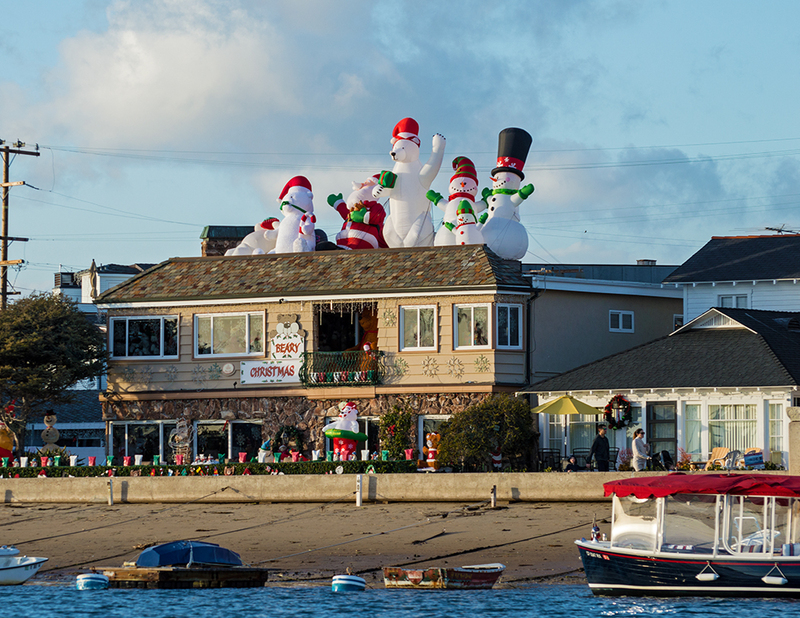 Seeing the Newport Harbor during the holidays is a must see, seeing it from a boat is even more magical. Voyager Boat Rentals was nice enough to stay around after they closed to let us take it out at night. We saw plenty of Duffys out on the night but weren’t sure if they were rented or private. If you can rent them, I would suggest giving it a try. 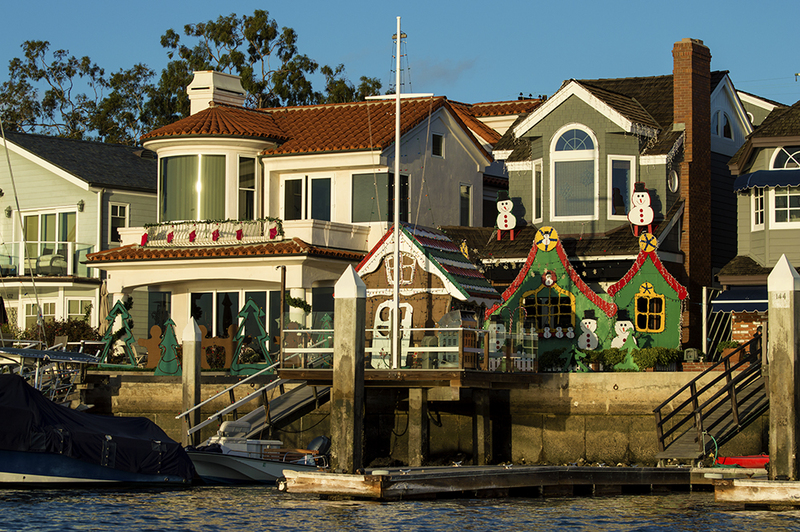 If you can’t get on the water to see Newport Harbor during the holidays, drive your car to the Pavilion on the Newport Peninsula and enjoy the boats and homes on foot. 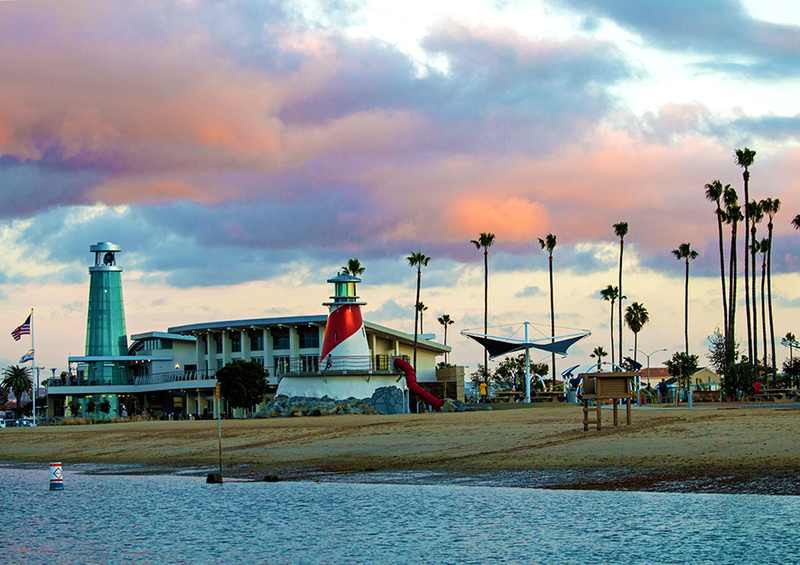 You can stroll the boardwalk and view the bay-side homes. 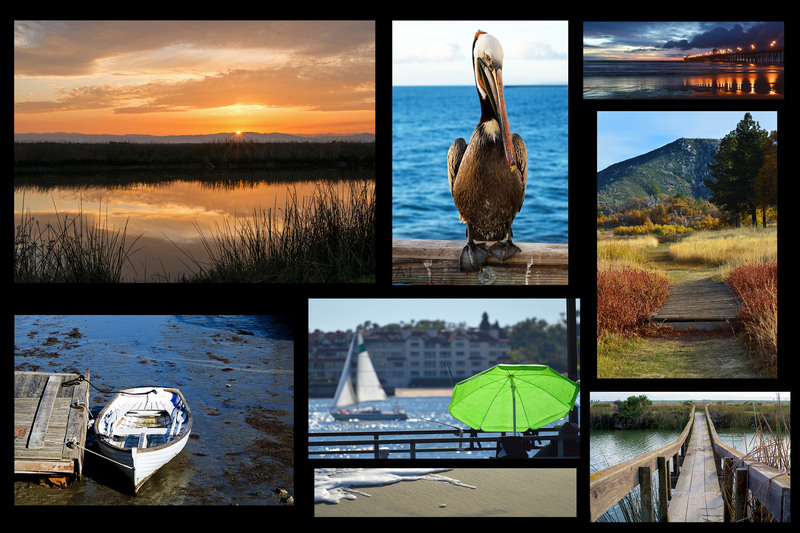 On the water or off, you won’t be disappointed. Homes facing west get the sun shining in their windows at sunset. 19th Street has a public dock and bathrooms. To the south is the new lighthouse park and cafe. 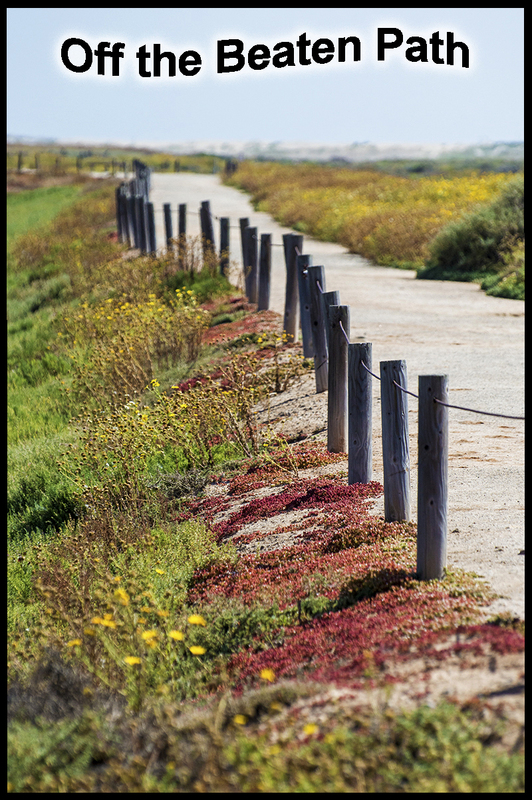 Previous PostPrevious 5 Fun Things to do for the Holidays in California.